With rounded contours, plush cushioning, and fine wood detailing, the Stressless Eldorado and its sibling Granada are truly sumptuous. The unique combination of comfort and elegance make the Stressless Eldorado one of the most sought after sofas in the Stressless collection. Designed with comfort in mind, the Eldorado surpasses all expectations. 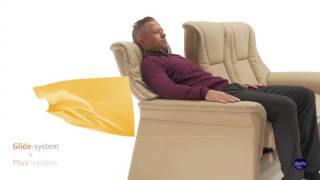 Using the Stressless patented Glide®, and Plus® systems, the Eldorado responds to your body’s slightest movement. This collection delivers superior support and unprecedented comfort. Complete your room with a coordinating Manhattan or Oslo chair, loveseat, sofa, or sectional.